The box sits on the floor so the chicks are exposed to some level of cold. The box traps moisture, making it hard to keep the chicks completely dry. Chicks can become crowded as they grow. Keeping the box clean is difficult because the cardboard isn’t very tough. Chicks can escape when they peck through the side of the box. With this in mind, I decided to build a brooder box this year. I wanted a permanent place to grow our chicks that would be easy to keep clean, provide a dry environment, and keep the chicks secure so nothing would eat them. The box also needed to provide plenty of space. The only problem is that a box used strictly to raise chicks would sit idle for most of the year. Normally, the chicks stay in the cardboard box between four and six weeks, so building a brooder box just for that purpose would be a waste of time. I got the idea to build a combination box. Our rabbits are normally weened from their mothers about the same time as the chicks go to the chicken tractors. So, I created a combination box—one that would support both chicks and rabbits so that the box would remain in use for most of the year. With this in mind, the bottom of the box would have to use hardware cloth so that the rabbit droppings would drop through. When the box is used for chicks, a plywood insert provides a solid bottom that is easy to clean. So, I build a 4′ × 8′ bottom. Notice how the 2 × 4’s are put together. They act as runners to make the cage easy to move around, yet provide stability. 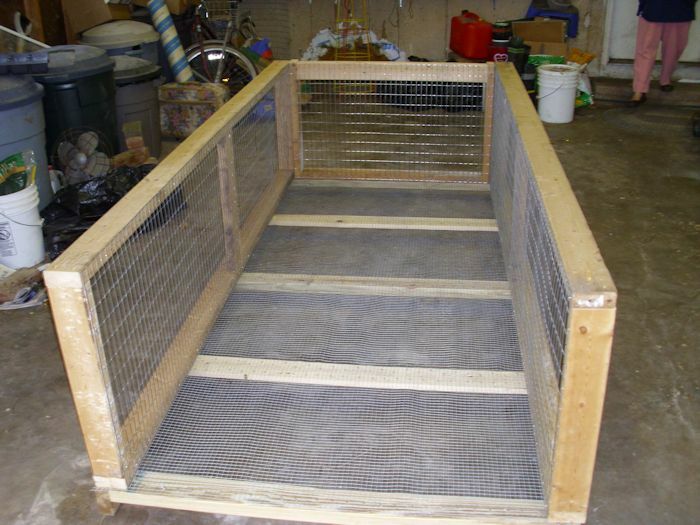 I had thought about putting the cage on wheels, but adding wheels would have been expensive and would have kept the cage too far off the ground for the rabbits to grab grass that pokes up through the bottom. In addition, given that we have no flat ground on our property, the cage would have a tendency to move around on its own. The bottom is covered with 1/4″ hardware cloth that I salvaged from the chicken coop some friends helped me tear down (see the Starting a Chicken Coop post for details). Keeping the bottom this high also keeps the chicks warmer because they aren’t feeling the effects of the cold floor. Any dampness also goes through the hardware cloth to drain off away from the chicks. 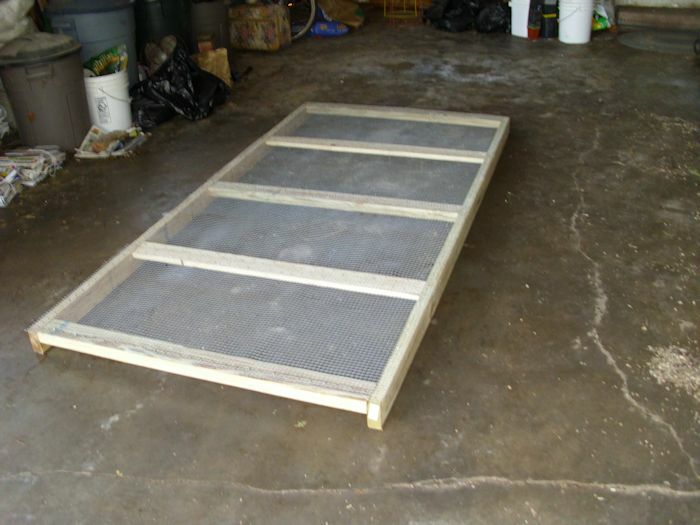 The sides are built using 2 × 4’s and are covered with 1″ × 2″ hardware cloth. I chose to make the sides 30″ high to ensure that the chicks couldn’t fly out too easily without having to cover them too early. In addition, the high sides would keep drafts off of the chicks during their early development. The high sides also make it less likely that predators will easily access the rabbits we put into the cage later. 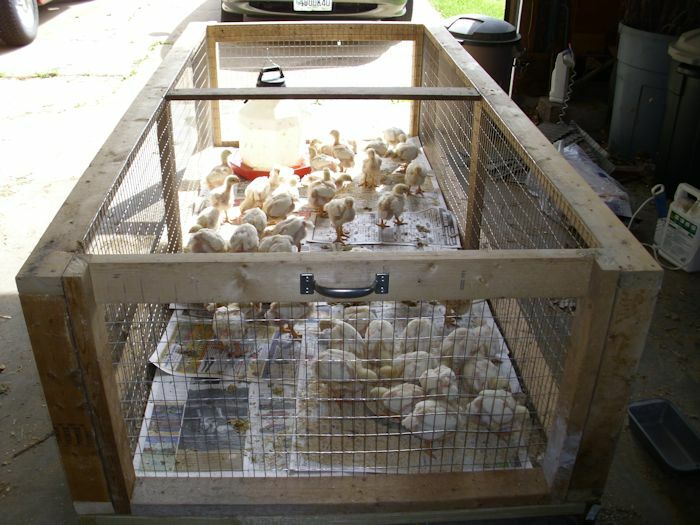 After the chicks grow large enough that they no longer need the heat lamps, we can remove the four inserts and let them roam around in the full 4′ × 8′ cage. The box is large enough that I can simply shovel out the newspaper once it’s no longer useful and put in new. The birds remain completely dry and their environment lets them get plenty of exercise. We keep about half the cage in sunlight during the morning hours so that the birds can choose to bask in the sun or relax in the shade. An interesting thing happened with this new brooder box. Our chicks grew significantly faster and didn’t even go through the usual “ugly” stage as their feathers came in. The new brooder box has performed well beyond expectations and we expect to get many useful years out of it. 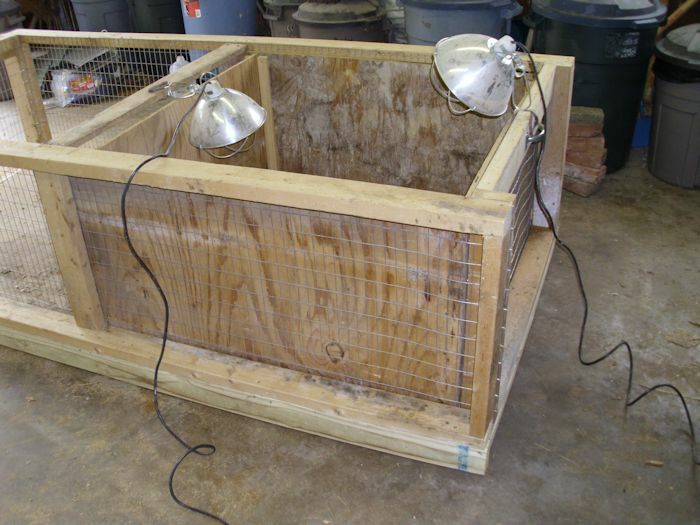 My next post will show how the cage is used for rabbits. It’ll have a removable roof in place and the plywood floor will be gone. In the meantime, let know if you have any questions about the chick (brooder box) configuration of the cage at John@JohnMuellerBooks.com.